We offer two lines of power connector - the 3455R, and our premium E-5. The 3455R features a durable plastic body with a clamshell opening, and rhodium/silver plated copper contact surfaces. 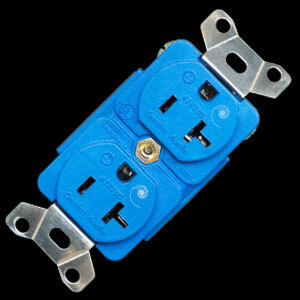 A US, Schuko and 15 Amp IEC are available. The 3455R connector is used on most Cardas power cables. The E-5 connectors also have copper blades, plated with rhodium over silver, and offer heavier-duty termination points for heavy gauge conductors. 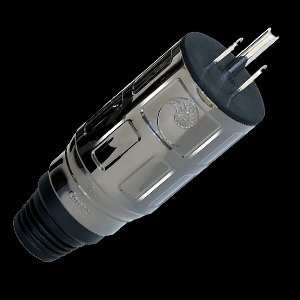 The E-5 is housed in a non-magnetic, anti-resonant metal outer shell, which is chrome plated and clear coated. 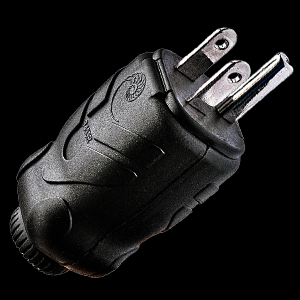 The E-5 line includes US and Schuko wall plugs, as well as 15 amp and 20 amp IEC connectors. We terminate Clear Beyond and Clear Beyond XL Power Cables with E-5 connectors. E-5 Copper contact surfaces with rhodium/silver plating. Non-magnetic, anti-resonant, chrome-plated & clear coated metal body. US, Schuko, 15 Amp & 20 Amp IEC. 3455R Copper contact surfaces with rhodium/silver plating. Durable plastic body with clamshell opening. US, Schuko, 15 Amp IEC. 4181 US & Schuko Premium Cardas power outlets.